No spoilers will be tolerated. Thanks. 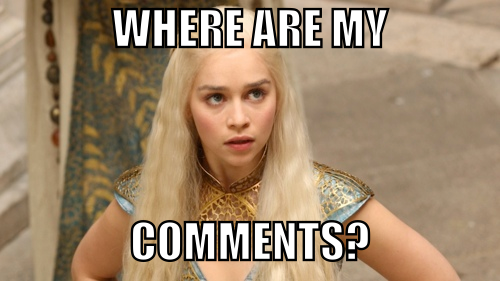 I’m noticing that recently there are a lot of blogs out there that are not allowing comments. I am not talking about specific subjects that could be controversial, and have the comments closed to avoid flame wars or trolls. But the total removal of comments, since the beginning. I must confess I don’t understand it, as my way of approaching a blog is not as a closed book, but a place where discussion can improve the original post. Sure, when the number of comments reaches a point, there can be lots of duplicated or low level comments. But I don’t think that a reason to not allowing any. That’s why there are moderation tools. But, ok, let’s say that I get the idea that a blog post is something complete, and nothing needs to be added to it, as it clearly expresses an idea. In that case, why are there some blogs that, instead of having their own comment system, they are linking Hacker News as a way to encourage discussion? Well, Hacker News is awesome, the community is great and there are lots of interesting discussions there. I check it frequently. But there are problems with that. First, that you don’t have any kind of control over it. For example, I like to know what are the comments from the original writer. Sure, you can explicitly say it, but it’s not evident. 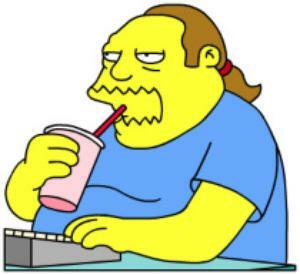 I also like avatars, they help me keeping track of people writing more than one comment or in more than one post. I also like trackbacks. Maybe you prefer those details in a different way, in the exact way that HN is making them. But you cannot decide it. You also don’t “own” the comments in any way, so if HN decides at some point to delete old comments, you can’t do anything about that. You can’t move them. You are also not notified with new comments. And finally, my impression is that Hacker News favours the “for new content only”, making people not commenting old posts. That is probably happening everywhere, sometimes I feel that is “not proper” to comment after a couple of days has passed, or if the post is old. With HN comments I think that is exacerbated. Again, I love Hacker News. But I think that only allowing discussion there is giving away too much. I’ve been thinking a lot about writing about this. Probably has been enough time to try to put it on a coherent story. I’m not going to saying specific names, though. So, around 7 years ago, I had the itch to start my own business. As you can see in this blog, I am a software developer, but at that time I had been working as a consultant, having some contact with the business and entrepreneurship world, so I somehow perceived that as a possibility. As every other geek fellow, I had the dream of owning a comic book and related geek stuff shop. You now, the “Android’s Dungeon” kind of stuff, where you can buy comics, manga, boardgames, RPG games, action figures, etc… I was living in Toledo, Spain, which didn’t have any of these shops, so I though of that as an opportunity. Also, some research on the Internet showed that there was a franchise expanding at that moment, which also encouraged me in the way that I could get some help (at a cost that seemed reasonable). They had a big online shop that had been working for some years and around 3 shops all over Spain, including one in the same location as the central warehouse. They were creating a network of shops to grow the business, and in a few months they was about 10 shops open. The idea was to operate as a central point of material for all the network, providing all the stuff to their network. My idea wasn’t really about making a big business, but more like a self-employment / family business kind of thing. So, I give it a though, make some mental calculations, obtain a loan from the bank, and went for it! Brilliant! I must confess I was really excited.